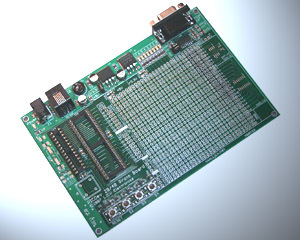 The PICDev 28/40 is a generic Prototype Development Board for a large list of 28 or 40-pin PICMicro Microcontrollers. The board includes 5V and 3.3V Voltage Regulators and a jumper to select the operating voltage for the Microcontroller. In addition the PICDev 28/40 includes an RJ-11 ICSP interface connector for MCU programming and debugging with development tools such as Microchip Tecnology ICD2, and a standard RS-232 serial interface. The 3" x 3" prototype area has more than 800 connection points available with 0.1" spacing and easy access to power supply sources, MCU I/O ports, 3 user push buttons, 8 user LEDs (limiting resistors included), and SOIC-8/SOT-23 and SOIC-16 pads for SMD packages. The board layout includes several alternative MCU clock configurations.